Leave chicken marinating overnight with cumin. 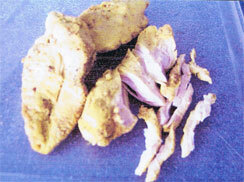 In 1 ltr stock cook chicken and corn until tender. Then shred chicken and leave it aside with corn. Add 2 more ltrs stock and potatoes. Cover and simmer. When potatoes are soft, crush them to thicken soup and put in chicken, corn, 1/2 pack Guascas and salt, cover and simmer again for 10 min. When served, add capers and cream. You can eat this soupt with white rice and avocado. Tip: In some countries Guascas are unavailable. 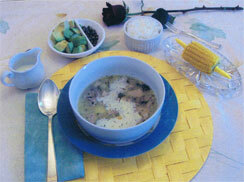 You can give this soup a special taste by replaycing with 1/2 cup basil leaves, finely chopped.